Online shopping has grown by leaps and bounds over the past few years with a plethora of shopping websites mushrooming all over. To me shopping online is so convenient. You don’t need to get dressed and drive to your favorite store. You can easily visit their website, find the product you want and buy it without getting out of your pyjamas. Shopping online allows you to buy things without hurting your schedule. Anything you every dreamt of is available online and delivered to your doorstep. With shopping now at your fingertips,the Online shopping sites offer one pleasure as well as ease. Jabong.com is India’s leading online shopping website which provides you the privilege of shopping from the comforts of your own home. It is a young and vibrant website that aims at providing you with good quality branded products at reasonable prices. It was started in January 2012. The site’s products are categorized in to clothing, shoes, jewelry, fragrances, bags, toys, furniture, sports items and beauty products. It caters to the fashion needs of men, women and children across apparel, footwear, jewelry and accessories. At present, the site is handling over 700 brands and 50,000 products. I had heard so much about Jabong.com and have seen several of their funny catchy advertisements, so I was curious and decided to try out the website too. I took my own sweet time to browse through their extensive selection of accessories and apparels. The different sections are so well categorized and the layout is so easy to navigate, that it makes it easy to find exactly what you need easily. 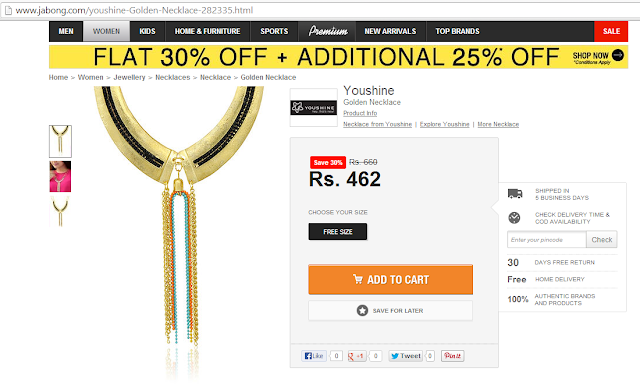 I had my eye on quite a few fabulous looking items, but since I’m quite a jewelry maniac, I took my time browsing through their fabulous jewellery section and managed to narrow it down to this ‘You Shine’ exotic gold statement neck piece. After signing up and filling in my shipping details, I placed an order for the Neck piece, on the COD option, which is an nominal extra charge of Rs.39. It was my first purchase on this site. 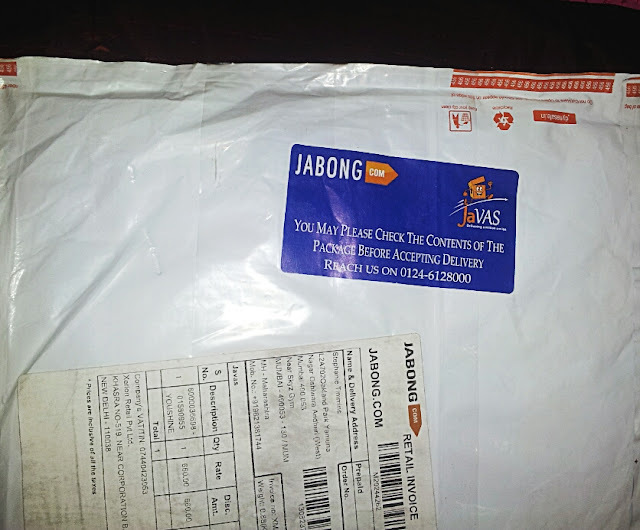 After ordering the product I got an email and confirmation call from Jabong, an automated computerized call from their office. Once confirmed, I was kept updated about the status of my order through text messages on my cell. I received my order promptly in 5 days in perfect condition, in a sealed package neatly lined in bubble wrap. Their packing is pretty awesome. From their packing, it is clear that are they ensure a 100% secure transaction. The fabulous part is the courier service they use – Gojavas, that lets you open the package, allows inspecting the product for any damage or missing items, before accepting the delivery and they also take back the parcel if the size doesn’t fit. I Got a delivery confirmation sms too with the caption “Delivering million smiles“. 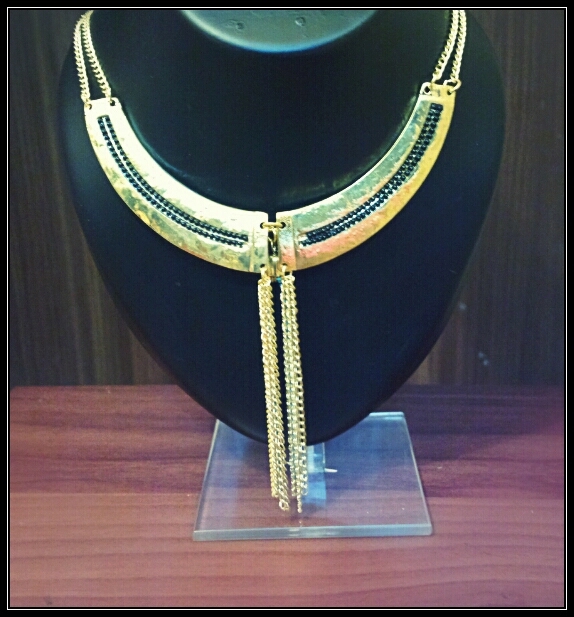 The Neck piece from Jabong.com was as stunning in person as displayed on the site and of fabulous quality too, I’m can’t wait to style this glamorous neck piece with my new LBD for a night out. Ease of navigation: The site is really user-friendly, everything is well organized and the products have been tagged under several categories, which makes finding and choosing the exact product you want easy and time saving.This makes purchase decisions easy and helps you shop as per your budget. It offers around 5-6 images of the product, each showing different angles of the product- being quite a stickler for details, I loved this feature of their website a lot. Extensive variety of products and multiple brands for men, women and kids for clothing, shoes,bags, watches, fragrances accessories,home decor and beauty. The site has endless choices and brands to offer and I bet you can literally spend half the day just browsing through the site. I especially loved the inclusion of premium brands like Desigual, DKNY and Tresmode too. Separate tab for Sales : If you just want to browse products which are on sale then just directly go the tab Sales on the right corner of task bar. Prompt Delivery: I placed my order on 24rd August and got it on August 29th. Pretty decent 5 days delivery time. Their Packaging is pretty good: All my products arrived in perfect condition- No damage,nothing broken, everything was perfectly bubble wrapped. Free shipping on most of the products. Now, who does not like that? COD option is there! So, if you are hesitant to make an online payment, just go for Cash On Delivery! 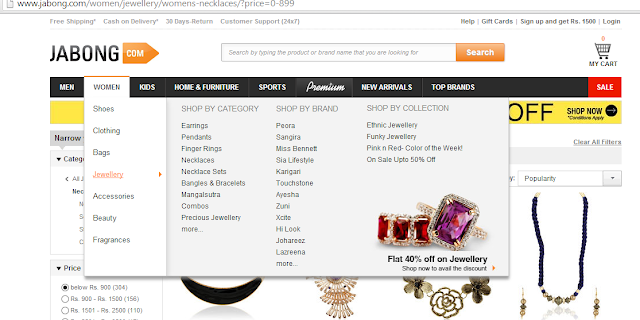 Ease of placing the order– Placing an order on Jabong.com is super easy..Like 1..2..3 and you’re done! They save your shipping address and so, if you want to shop again, you don’t have to type your address, phone number etc again. Great Customer Service– Their Customer Service is great and helpful and kind and they respond fast too! Returns are an easy procedure with co-operative customer care. The best part is that they always confirm thrice on the delivery after the order is placed via phone call, SMS and email. I would like them to add more brands to the Jewelry section, I was disappointed not to find my favorite brand Accessorize listed, though they have make up from Accessorize. 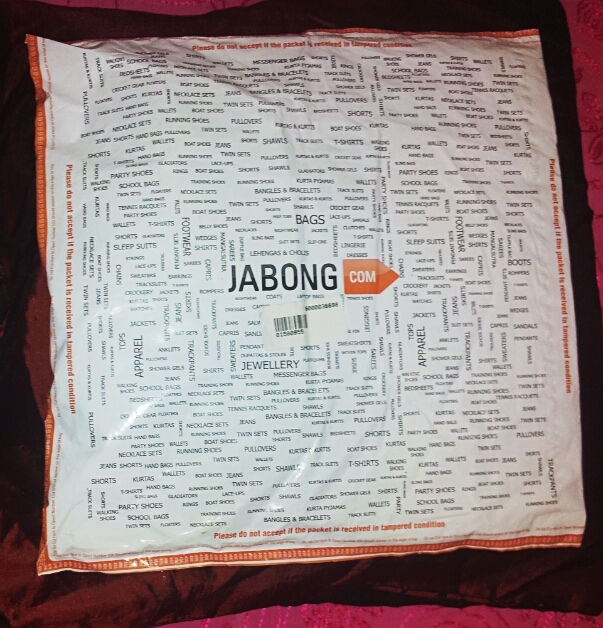 Overall I had a very pleasant experience with Jabong.com and there are so many more items on my wishlist, I do hope to shop there real soon. 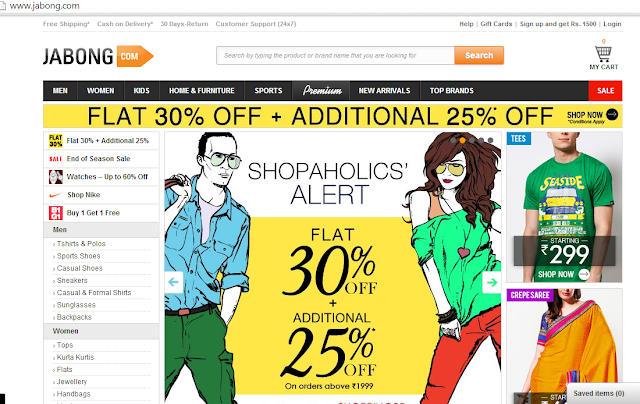 So people I say don’t hesitate and just visit Jabong.com for an affordable and stylish shopping experience. Disclaimer: I have been gifted a voucher for this review and but the above is my honest unbiased experience of the site. I like shopping on the web need to check this out. wow, <3 that necklace. I have shopped from them as well, and agree with ur shopping experience too ! Thanks for visiting my blog, i started to follow you on bloglovin, google+ and fb with the account of the fb page of my blog! I hope you follow me back! Very cool, love this necklace! This looks good, I will check it out! I think Jabaong provides the best shopping experience and one more thing you may try a thing and if you found good then you pay the amount.